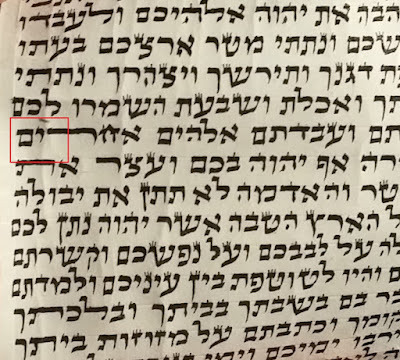 I am hoping to write myself a Sefer Torah on g'vil, but in my limited attempts at writing on it (mezuzos) I have had very little success writing sharply at all. 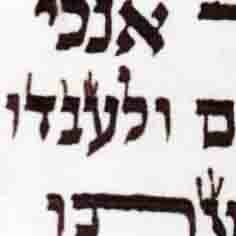 I have been writing with d'yo ashan sh'manim. Does anyone have any experience and/or tips on how to write well on g'vil? Almost all the Teimani sofrim in Israel switched to writing with Dio Lanetzach. There is a special thick formula for Gvil. Does that have to be specially ordered or is it the regular dio lanetzach? It is a matter of writing convenience. All Dio Lanetzach can be used, but, sofrim tell me that it is easier to write on gvil with thick ink. #273 is a specially thick formula for that. Dio Lanetzach is easily erased by lightly scratching it with a sharp knife. The beauty of Dio Lanetzach is that it is Hallachically a real ink - which means that it sits on the surface and does not soak into the gvil ot klaf - as opposed to מי עפצים וקנקנתום which get absorbed into the gvil, so erasing it involves also removing some of the gvil. פלוגתת הפוסקים בדיו עי' בני יונה דהעולה להלכה ולמעשה כי גדר הדיו הוא הצבע השחור המעובה שאינו נכנס בתוך עובי קלף מעבר לעבר כצביעת בגדים, וגם אינו כמיא בעלמא, אלא ע"ג הקלף ונדבק בו ויכולין למחקו ולהסירו ממנו. (חידושי חתם סופר, גיטין, יט, ע'א). Real ink must be removable from the surface without removing some of the gvil or klaf. Isn't a Mezuzah passul on gvil? It needs to be written on duchsostos or klaf. According to the Rambam, it is tefillin that are pasul on gewil. Does anyone know of "normal" European-style klaf that is made without sid? Actually, when tanned in 'afatzim, the tzad hase'ar can be split from the tzad habasar as described in the early sources and it is quite clear that the tzad habasar is the dermis, which is what we commonly write on, and the tzad hase'ar is the epidermis, which we call the litza and some prefer to leave on based on the Chayei Adam, but the rishonim who "wrote on the tzad hase'ar" quite clearly describe removing (they are m'taretz how we can remove the outermost layer if klaf is the tzad hase'ar). Both from a halachic as well as an historic viewpoint it is absolutely fascinating! I still make and write on gvil fairly often, in fact I've just finished a new batch of very nice calfskins for a gvil megillat esther. When it comes to writing, you really need to learn a totally new technique if you're used to writing on klaf. The biggest issue on gvil is controlling the flow of your ink. Forget using nahari, hadar or just about any other commercial ink. Stick to dyo ashan. It should have only three ingredients: soot, gum arabic and water, the Rambam says to add honey. Fine, but nothing else. This is important. If your writing with a reed soak it in water for a good ten to fifteen minutes before you intend to write. 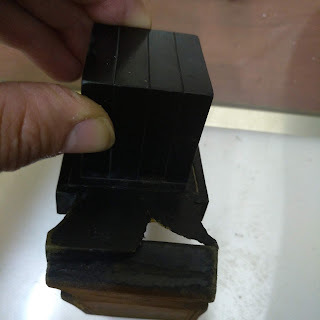 Also important is to prepare your inkwell properly. Take a clean jar, in the bottom put some cotton fiber, like you find in a medicine bottle, enough to fill it most of the way. Then pour your ink in carefully, you only want enough to saturate the cotton no more. It shouldn't be swimming in dyo. As you write dab your reed against this. The Sephardic scripts are designed to be written with reeds on gvil, so by nature they are more rounded and less crisp than their Ashkenaz counterparts. If you really feel you have to have sharper writing than a reed will give you, you could try using one of those left handed fountain pens intended for calligraphy, they give very good results. Just load it with your dyo ashan and you can write for lines without redipping. To erase, don't use a knife, a razor or a sandpaper. This will absolutely ruin the surface of your gevil. Instead take a damp cotton swab, a Q-tip for example, and simply dab the ink off. This is why it's critical to stick with the simple dyo ashan, other types of ink won't let you do this and you'll be left with a mess. Remember, the surface of gevil is sized with a coating of hide glue (gelatin) to keep the ink from spreading, don't wipe too vigorously or when you go to write again the ink will bleed. Thanks. I was using Tsadok dyo ashan shmanim. I wrote one mezuza on gvil and it came out less than beautiful and the next one on klaf me'uppatz and it was stunning in comparison. I was so shocked that I debated back and forth whether I should write a Sefer Torah, iy"H, on gvil or klaf me'uppatz, despite the clear halakhic advantage of the gvil, i.e. no question of tzad habasar v. tzad hase'ar.